ZION NATIONAL PARK – Among things Zion National Park and local officials are grappling with as they wrestle through the development of a visitor use management plan to address overcrowding issues are wider area busing possibilities and local access shuttle solutions. St. George to Springdale bus line? Part of the overall transportation picture and even solution within the county to Zion and Springdale’s overcrowding problem could be a bus line from St. George to Springdale. The line would be operated by SunTran, which currently operates in St. George and Ivins. Discussions to this effect started two years ago. Springdale Town Mayor Stan Smith said it’s still in the study process but he thinks it is viable. There is even talk of establishing a regional transit authority for the whole county, Smith said, but it has met some resistance. A lot of people in St. George say that such a bus line is not going to do any good, but Smith begs to differ. The first advantage of such a bus line, he said, would be that it would give disabled St. George residents more freedom to come to Springdale. By the same token, it would give aging Springdale and Rockville residents the chance to easily get to St. George for doctor appointments, other errands and even to serve in the temple of The Church of Jesus Christ of Latter-day Saints, to which many belong. Currently, Smith said, residents in this situation have to ask others to take them, which can sometimes be an inconvenience. The second advantage of a bus line between St. George and Springdale would be its benefit to employees who work in Springdale but live elsewhere. Smith sees it as a way to eliminate more cars in Springdale. Smith said he hears from many Springdale business owners who say they are regularly short-handed and part of the reason is transportation – it’s hard for some potential employees to get to Springdale. Most Springdale employees don’t live in Springdale because of its high cost of living, so a commuter bus that will get them to Springdale from the outlying communities like Virgin, LaVerkin and Hurricane would be a huge boon. Smith said it would also benefit the whole county by making it easier for county residents to land the higher-paying jobs in Springdale. A third advantage would be its alleviating congestion caused by day trippers – those somewhat local residents who visit the park and the town for the day. Smith sees day trippers as the greatest contributors to Springdale’s traffic and parking problems. If many day trippers used the bus, he said, it would alleviate traffic in the town. The benefit of a bus line to tourists flying into St. George Regional Airport secures a fourth advantage in Smith’s analysis. If airline passengers landing at the St. George airport could get on a bus to see Zion instead of renting a car it could benefit the airport which, in his view, doesn’t do a lot to promote tourism. Lastly, Smith said, planners need to get the City of St. George to see the vision of how nice it would be to have public transportation from the county’s most populous city to its most popular tourist destination. “You have to live ‘up river’ to see the situation,” he said. If a survey of 42 respondents, mostly locals, is any indication, public opinion is favorable to such a bus line. In the survey, taken for the benefit of this three-part report on the Zion “traffic jam,” 74 percent of survey respondents said they would strongly support or somewhat support a St. George to Springdale bus line. In their comments explaining their responses, 16 surveyed expressed they would strongly support such a bus line and several said they would ride it if implemented. 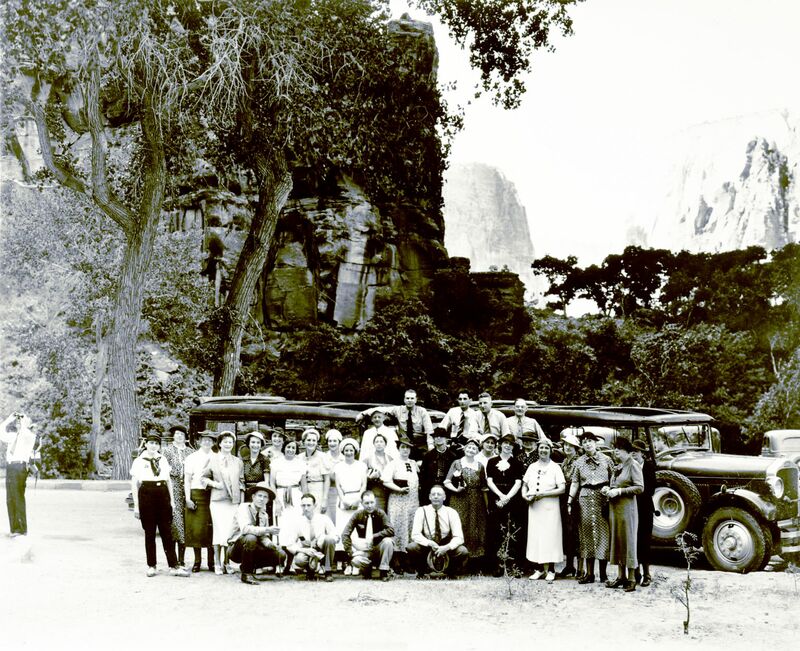 Sixteen years ago, Zion implemented its mandatory shuttle system servicing both Springdale and the national park. At the time, officials thought they had found a solution to weld the National Park Service’s two competing mandates: to offer a high quality visitor experience and protect the park’s natural and cultural resources for future generations. Early on, the system worked well and received nearly universal praise. Today, Zion park visitors sometimes have to wait in line 45 minutes to an hour to get on a bus that is standing room only. The shuttle was designed for 2.5 million to 3 million people, said Jack Burns, Zion’s chief of commercial services and partnerships and a near 30-year veteran of the park. Now, in 2016, the shuttle system is inadequate to efficiently move the park’s growing number of visitors, expected to reach over 4 million this year. Last year alone, Burns said, the park received 450,000 more visitors than the previous year and visitation has increased by 42 percent over the last decade. Park managers knew this day would come, he said, but didn’t expect it to come so quickly. The shuttle system was also designed to facilitate transit within Springdale. 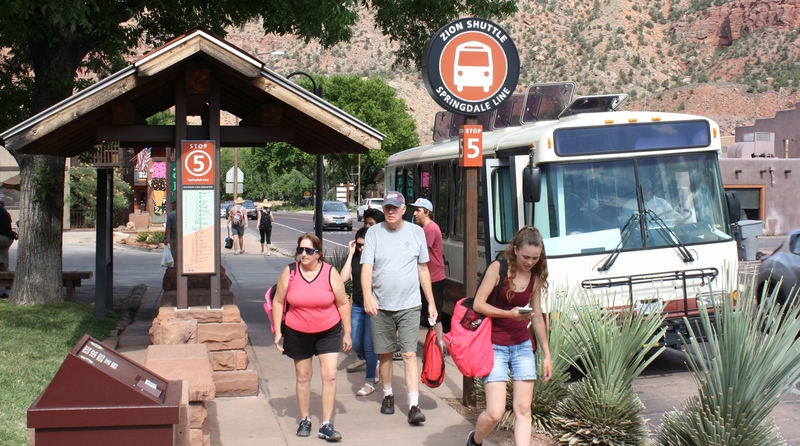 Zion National Park Superintendent Jeff Bradybaugh said the relationship the park has built with Springdale as a result of the implementation of the shuttle system is still strong. The same shuttle buses are being used today as have been since the shuttle system’s inception in 2000. Zion is now set to upgrade the fleet instead of replace it. The park is set to rebuild the propane engines in half the fleet, Burns said, and to retrofit the other half to electric motors. Burns said that $22.50 of the current $30 entrance fee for a private vehicle goes towards transportation. Parks Transportation Inc. has been in a service contract to operate Zion’s shuttle program since the shuttle’s inception. The company has been amazing, Burns said, attributing a lot of the shuttle’s success to it. I visited Zion last year and stayed in Springdale. Being an early bird,I was in the Park before the very efficient shuttles started running. I have NEVER seen a better shuttle system than the one operating in Zion. You never have to wait more than fifteen or twenty minutes to catch a shuttle. I don’t know where that 45 minute figure came from because I never saw anything like that the week before Labor Day. I was shocked at the number of day visitors who had to park outside the Park after filling all the parking inside the park. This proposed additional shuttle service is a great idea because visitors flying into the airport won’t need a car to get to Springdale or the park. It’s only about twenty miles from St. George to the park AND visitors might also appreciate staying in St. George instead of being a part of the horrifically over-priced food and accommodations in Springdale. I give this New Shuttle idea two thumbs up. My condolences to the family Bob ! So simply slap Springdale with a ‘transportation tax’ levy and start passing the fees on to the tourists. If St. George is such an inconvenience to drive from Springdale, then that resident should A: move closer to St. George or B: adapt. That’s like St. George residents complaining that Las Vegas is too far away and demanding a bus line from here to there. Yes, there are already shuttle services! And YES, you have to pay for the convenience! If ‘the church’ is so concerned about getting Springdale residents to volunteer at ‘the temple’, then ‘the church’ can create its own shuttle service. It is not a taxpayer’s burden or responsibility to supply you with ‘volunteer service’.